This reminded me of 27 Hours combined with The Blob, with Liam Neeson and his group of fellow Biig Oil workers marooned post airline crash and nasty wolves snapping up any slow or wounded stragglers. Where was Captain Sully? Katie (my daughter) thought the wolves were not realistic, but that did not bother me; they were scary and when they attacked it was effective. Tension was kept throughout, balanced with some hazy sentimental flashbacks. Liam plays a character similar to the one he played in Taken: a veteran dude, knows-it-all, wastes no time in taking action, and is above all a survivor. My one quibble: watch for the scene where the group stands on a cliff, and hears a river way down below. Then when they make it all the way to this noisy river it’s as calm as a small pond. Later, Liam extricates hiimself from raging rapids, and you see the stream is now about 10 feet in width and again back to calm. Where did all the water go? Anyway, this is entertaining and yes, there’s a quick scene at the end of the credits. Poor Liam Neeson! His life is going from bad to worse. The love of his life is gone, he’s in a plane crash and then when he survives that, he and the other survivors have to deal with these really ticked off wolves that are out for blood while trying not to freeze to death, starve or just get stuck in very deep snow. Liam plays the alpha male of the human pack trying to lead them to safety (while dealing with his personal demons) and hoping to get his shot at the alpha male of the wolves. Liam deserves credit for being an action hero with movies like this and Taken while in his late 50s. The tension between the wolves and survivors (and between the survivors) is good. This isn’t really my type of movie so it’s easy for me to poke holes in some of the situations, etc. but if you are into this sort of movie then you’ll probably enjoy it more than I did. I finally got around to seeing the non-talkie The Artist, which has been touted by many as one of the best of 2011. I cannot rank it as one of my ten favorites for the year, especially since my eyelids kept trying to close on me. 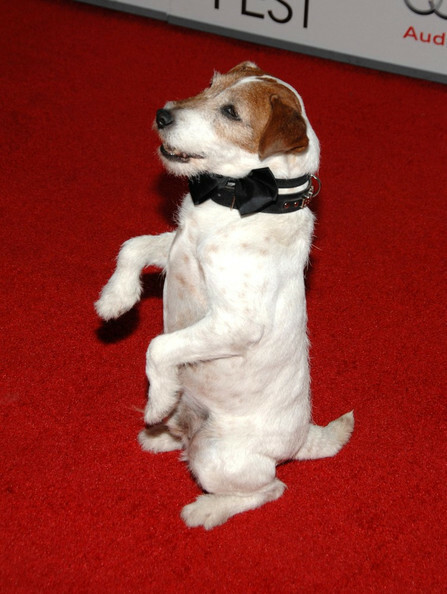 I guess it’s the best that could have been done without any dialogue, and the leading characters were certainly charismatic and expressive, especially Uggie the wonder dog (best supporting actor candidate?). If this had conventional dialogue, it would be evident how banal the story line is. I loved the last 5 minutes however, which was cleverly done, but in retrospect I’d rather spend my entertainment time watching some of the episodes of Treme I have saved on my dvr at home. Bill C., please pipe in with your review, I believe you liked it more than did I. This film did make my top 10 list, although I understand (and expected) Bill I to enjoy it less than I did. I viewed this homage to a bygone era of Hollywood movie-making as fresh and unique. I enjoyed the nods to Douglass Fairbanks, Chaplin (see A Dog’s Life if you get the chance), Rodgers and Astaire, A Star is Born, Singing in the Rain, and a bunch I’m sure I missed. The performances (dog included) were all top-notch (they are all great smilers except for the dog) and, like Bill I, I really enjoyed the ending. There were a lot of nice little moments in the film as well. I agree with Bill I that the plot was very basic, especially compared to many of today’s movies, but for me that was consistent with some of the movies it was paying homage to and added to its charm. Bottom line: I enjoyed this a lot, but if you’re looking for a plot-driven movie, this might not be the movie for you. Photo added by Bill I. Man on A Mission: Richard Garriott’s Road to The Stars is a documentary about Richard Garriott’s visit to the international space station as one of the first space tourists. He paid the Russians $30 million to take him up on a Soyuz rocket. I saw a special screening that included a Q+A with the director and producer. It’s an entertaining movie that gives good insight on Richard’s preparation and his visit to the space station. Richard also left his camera on to get some interesting footage during the re-entry and landing. In addition to Richard the movie features several interesting characters (including his retired astronaut father). This movie opens in N.Y. next week and in Austin the following week. Richard will be at the Austin premiere (he lives in Austin). This is a must see for anyone with $30 million considering a space trip and recommended for others just interested in the space program from afar. As tis has not opened in New York Bill I. has not had a chance to review this one. Ghost Protocol is the 4th in the series of Mission Impossible movies and is very entertaining. The action is non-stop and they have gone out of their way to out-do the action in previous movies. The movie really flies by and is fun to watch. Tom Cruise deserves kudos for really hanging on the outside of the tallest building in the world (with cables that were later erased using CGI). As a fan of the old TV series I think they rely a little too much on action and could use more brilliant plans to fool the enemies, but that is a small quibble. As in all of these types of movies you need to be ready to forget about reality and just enjoy the action. So I happily did that as Tom dangled off the building, had a high speed chase in a blinding sand storm (which miraculously ended just as the chase did), dropped multiple stories in a car, etc., BUT who could believe the ending: Tom Cruise watching his wife, who he pretended to kill and had to abandon prior to this movie, while she is hanging out with some new guy. When she sees him, she is happy to smile at him from a distance and then just goes on with her new life. Wouldn’t she either be totally disgusted to see him (after all he put her through in the last movie and prior to the start of this one) or if she loved him (and since he is Tom Cruise), wouldn’t she want to ditch the very heavy un-Tom Cruise like guy and reminisce about old times??? You can only suspend belief so much!